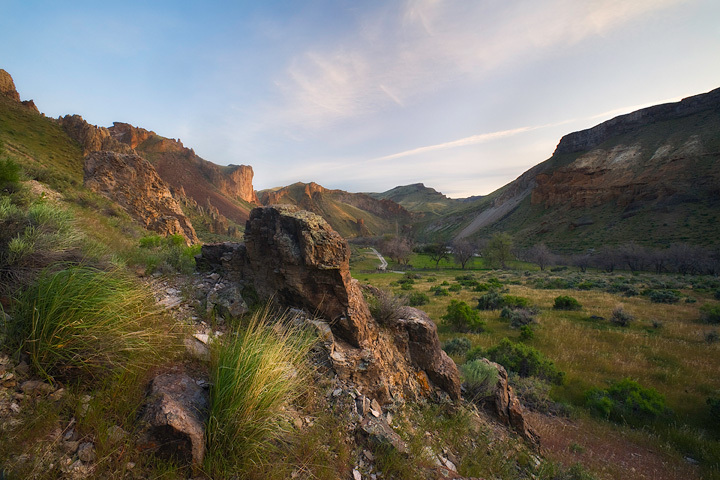 The spectacular Owyhee country connects the borders of Oregon and Idaho along the Owyhee River and its myriad canyons. This is an area I’ve explored over the years while hiking a number of side canyons and rims, but never explored seriously with my camera until last year. This spring I returned with fellow Photo Cascadia member Sean Bagshaw and revisited some of last year’s finds while exploring new areas as well. 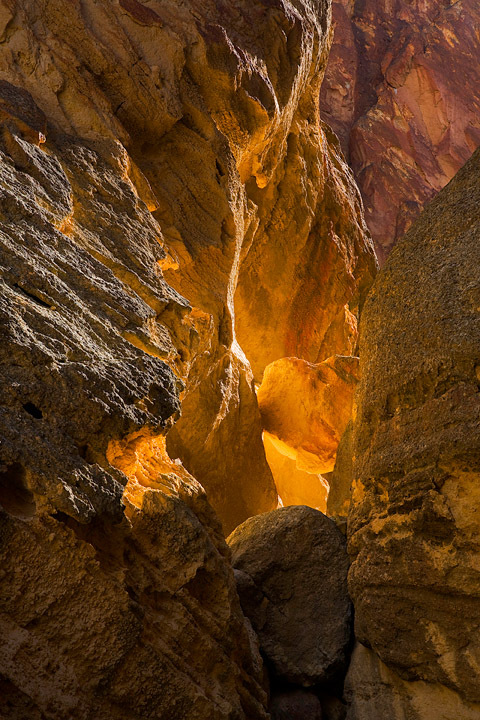 Beginning at Leslie Gulch, we arrived before sunset and explored our options for photographing. Given the clear blue skies we agreed that shooting down was better than the alternative, so we began to climb. 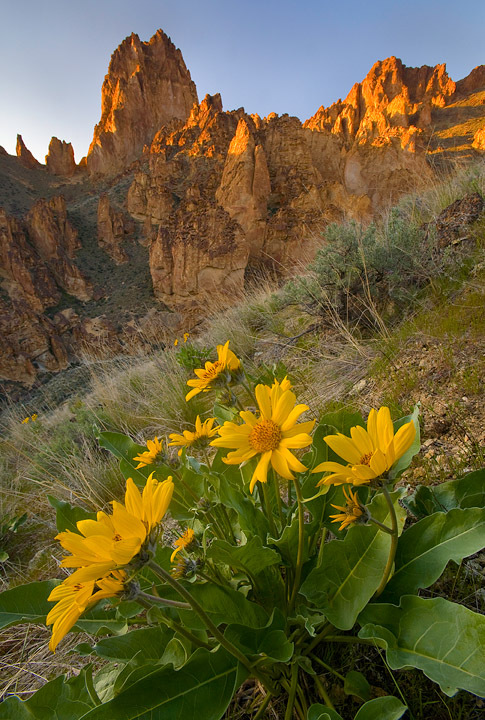 The balsamroot was in bloom and supplied great foregrounds for my images of the distant spires. Not a bad way to start a trip. At dawn we began another round of shooting; Sean heading for a spire I named “The Crown,” while I hiked up a side canyon to explore. The spires of the side canyon were magnificent, but the lack of good light directed my interest to the ground and the variety of flora. 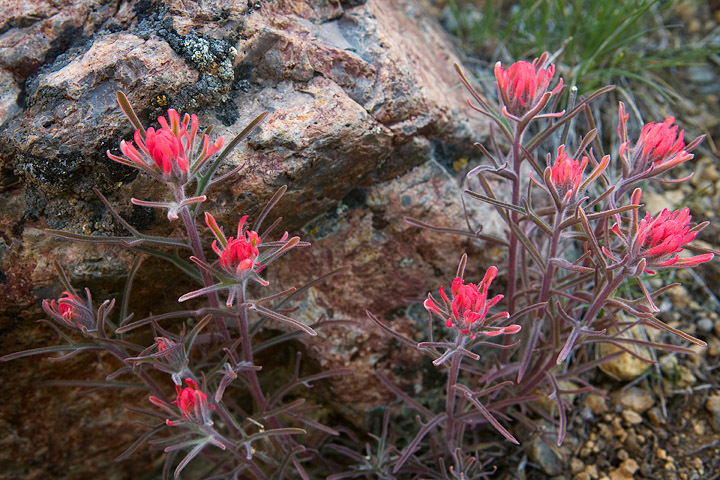 The desert paintbrush was near peak and made a nice bouquet next to a red stone. Meeting up for breakfast, Sean and I then headed up a narrow canyon I wanted to explore last year—but thought better of at the time for safety reasons. As we climbed, the side canyon grew narrower over a few small cliffs until we eventually reached an impassable (without gear) 30-foot downspout, and I was amazed at the 10:30am golden backlight that emanated from the canyon narrows. 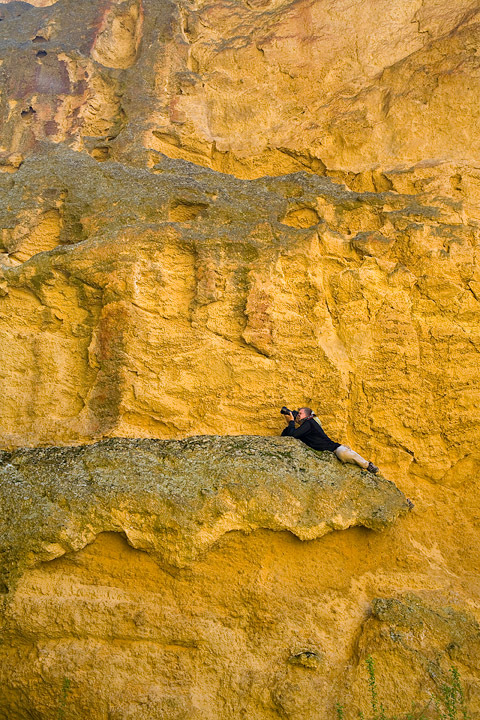 Sean climbed a cliff for a better look and began shooting. We explored another side canyon that brought us to some interesting geological layers, where the pastel colors looked like the hues of ice cream or bubblegum, and so I named it Bubblegum Canyon. 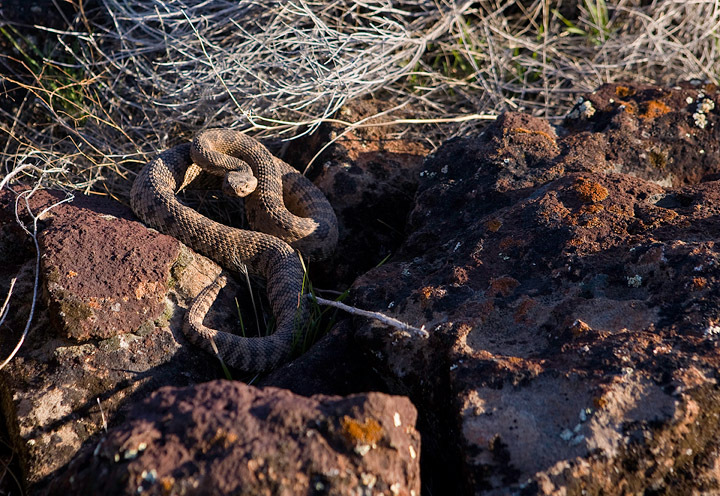 I didn’t want to leave, but we had a lot of country to cover so we bumped along the heavily rutted road to 3 Forks along the Owyhee River where we began a mile hike to the canyon rim to travel the overlooks. Aside from a few billion wood ticks and the occasional rattlesnake, the rim was beautiful and dramatic. 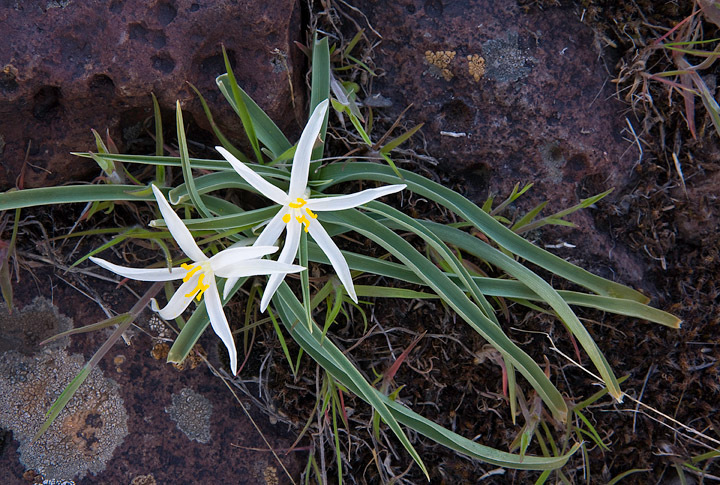 The Sand Lilies were also beginning to bloom, and as I shaded them with my body the reflective light gave them a nice soft glow. Sunset over the canyon added some color to the usually cloudless sky, and then it was a mile walk in the dark through tick-infested grasses. Back at the car I picked off over 50 ticks and Sean over 40, and we picked through each other’s hair like apes grooming for lice. I picked off 10 more ticks by morning, but all the imagined crawling felt like 250 more, and my tick phobia went into high gear. 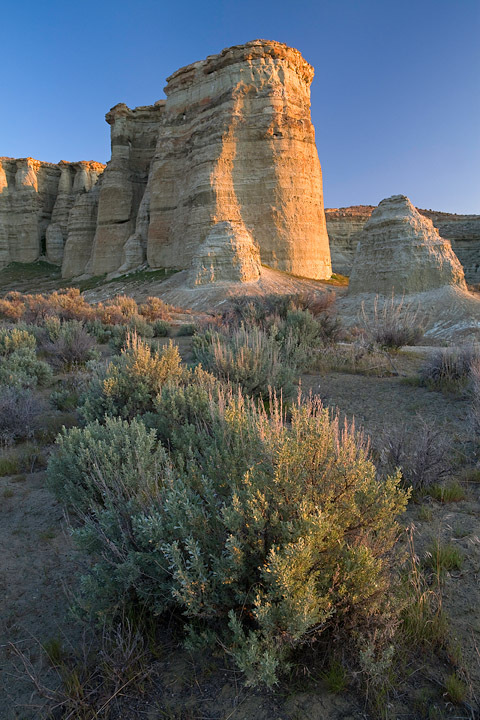 Dawn brought us to the Pillars of Rome along the banks of the Owyhee River and the soft glancing light lit the cliffs beautifully. We debated where to explore for sunset, and finally decided to head to Jordan Craters and then Birch Creek Canyon. The spatter pots, Coffeepot Crater and the pahoehoe basaltic lavas of Jordan Craters were fascinating and made for some interesting compositions. A few miles further we descended deep into Birch Creek Canyon which connects to the Owyhee River. 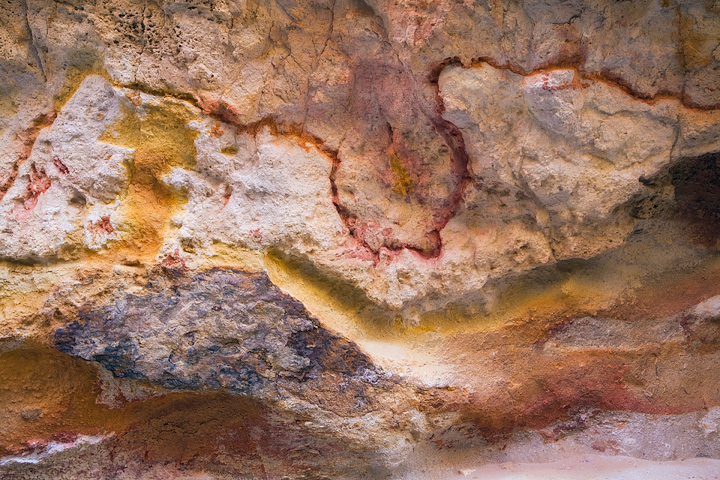 This canyon was a gem, with a variety of formations, colors, and patterns. As the sky began to cloud we wondered if we would get a spectacular sunset or a dud, as it turned out it was something in between. It didn’t matter. This new-found area is ripe with possibilities and a place I’ll be eager to return to in the coming years. 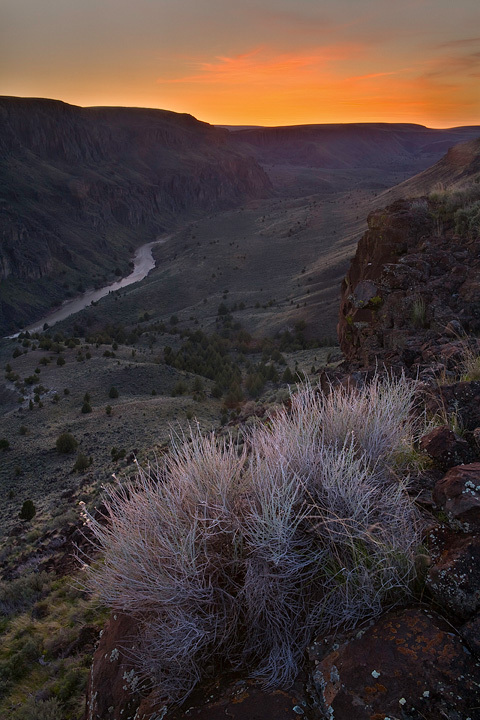 The Owyhee country is huge, under photographed, and the possibilities are limitless. I think of it as the Painted Hills and Smith Rocks of Oregon on steroids. I’ll be back next year, and I’m already thinking of a photography rafting trip and a backpacking trip to some more remote canyons for future exploration. ~ by photocascadia on May 9, 2011. Thanks Floris, it is different and that’s what brought me there. OK – so where are the tic photos? It was too dark, and they were racing too fast to my head. Plus my hands were too busy flicking them off to operate a camera, but most of all I didn’t like their smile. Nice photos, I particularly like the last one. The area looks very beautiful and reminds me of the Badlands in Alberta, Canada on a larger scale. Thanks Vincent, it does look a bit like the Alberta Badlands.